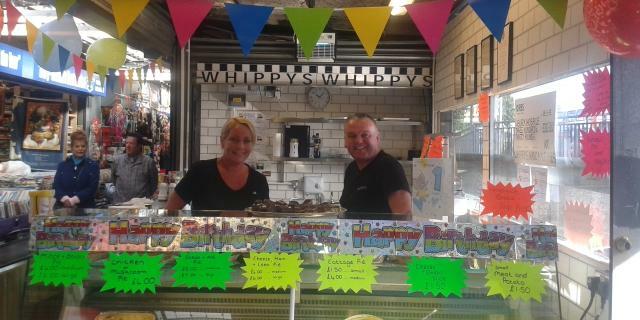 Whippy's Pies have celebrated their first 12 months on Bury Market by announcing their expansion into a second stall on Margaret Block. Stall operator Pete Whipp said: "We would like to thank all our customers, fellow traders and the market's management for all their support. Our business has gone from strength to strength and we have just taken over our neighbouring stall and will soon be expanding into this. "When we first started we were lucky enough to have a feature in the Bury Times which has had a massive impact on our business and gave us a great start upon which to build." Whippy's have also been busy supporting charities and community events, including recently helping Key 103 organise a '1-hour' wedding by catering for 150 guests. Stall co-operator Emma Scott said: "We have always felt that a business should be part of the community and we are grateful to everybody who has helped us support various charities and community events." "We hope to be here serving our hand-made pies for many years to come!"